Sweet, naughty and delicious, Mary Berry's no-churn ice cream is gorgeously smooth and so easy to make at home. Serve with the quick glazed pineapple for a relaxed summer dessert that's perfect for barbecues. For this recipe you will need a 1 litre/1¾-pint freezer-proof container or eight ramekins. For the ice cream, put the raisins in a saucepan. Add the rum and gently heat until just boiling. Spoon into a bowl, then cover and leave to soak overnight until all the raisins are plump and the rum has been absorbed. Pour the cream into a large bowl and whisk using an electric hand whisk until soft peaks form when the whisk is removed from the bowl. Carefully fold in the condensed milk, then the raisins and any excess rum and mix well. Spoon into a 1 litre/1¾-pint freezer-proof container or eight ramekins, and freeze for a minimum of 12 hours or overnight. For the glazed pineapple, remove the base and top of the pineapple with a sharp knife and slice off the skin. Cut the pineapple lengthways into eight wedges, then remove and discard the core. Heat a large griddle pan until very hot. Use a heavy-based frying pan if you don’t have a griddle pan. Mix the sugar and rum together in a small bowl. 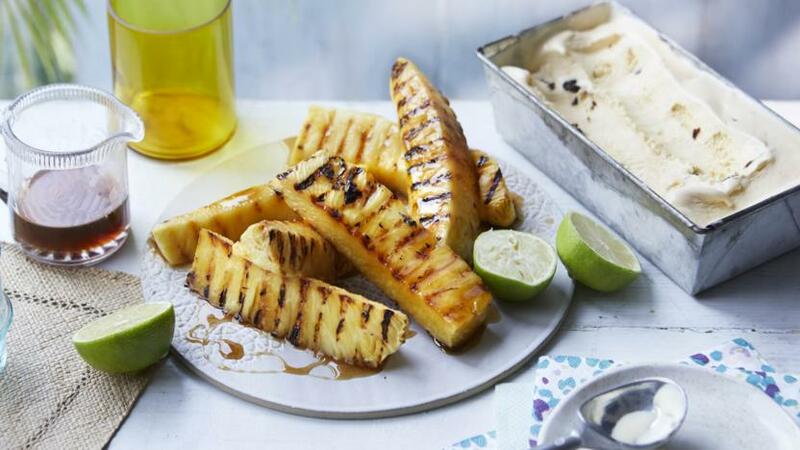 Brush the rum glaze all over the pineapple wedges, then place in the pan and chargrill for 1 minute on each side or until golden and with griddle marks on the fruit – you just want to glaze the pineapple, not cook it, as it should still be firm when you eat it. Serve scoops of ice cream and the glazed pineapple drizzled with lime juice and any extra rum syrup. Spooned into ramekins, the ice cream will freeze more quickly – in just a few hours. Don’t overfill them as the mixture will expand as it freezes – ramekins with a capacity of 150ml/5fl oz would be ideal.